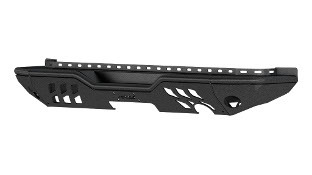 The TrailChaser® Jeep bumper is a unique replacement bumper option for the Jeep Wrangler. It features a modular design that provides multiple configuration options for the front and rear. 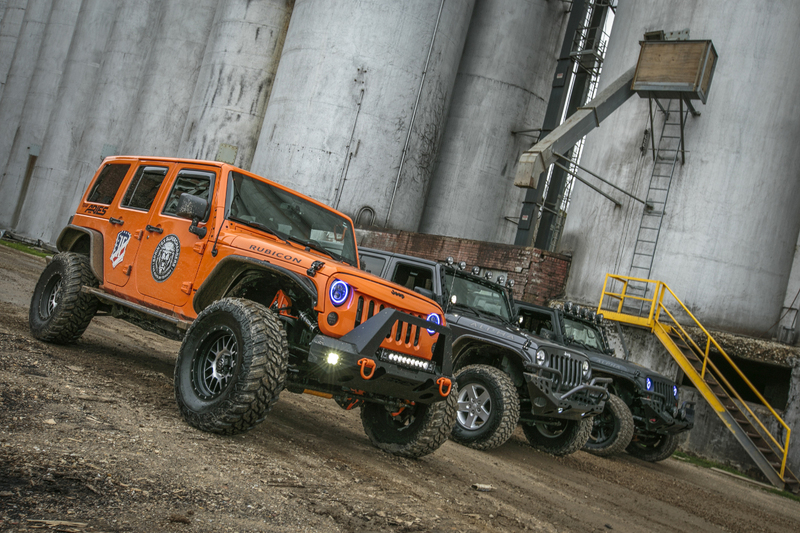 No matter what your style, the TrailChaser® allows you to select the look that best matches your custom build. 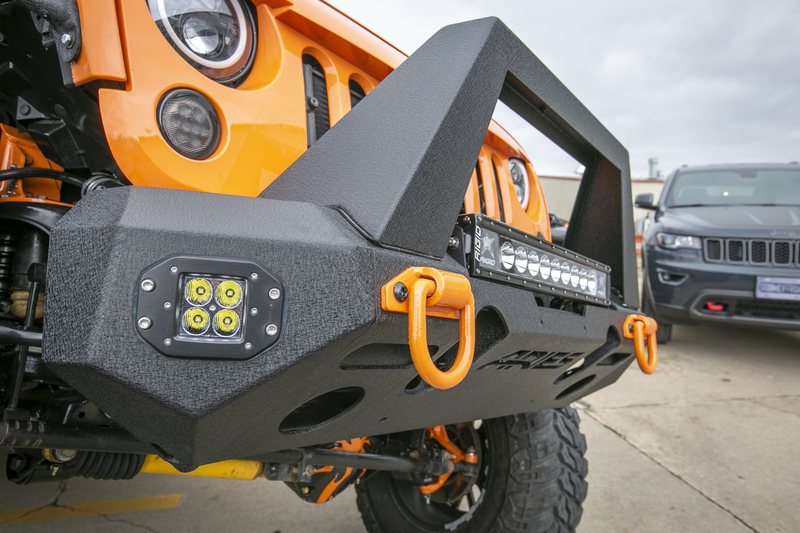 To fully equip you for the trail ahead, the TrailChaser® Jeep Wrangler bumper also accepts a wide variety of accessories, including LED lights, tow hooks, a winch and more. 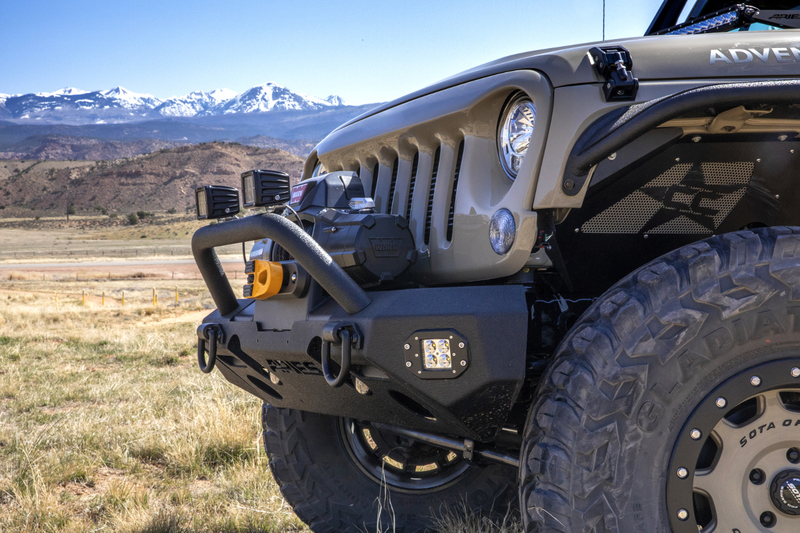 The front and rear TrailChaser® bumpers are comprised of multiple modular components, allowing you to mix and match for whatever look suits your Jeep. Each configuration is available in aluminum or steel. 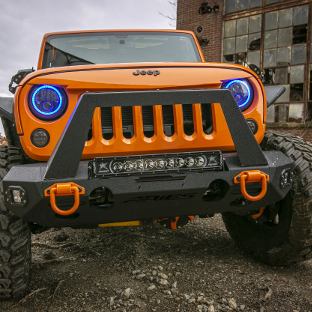 The TrailChaser® bumper is uniquely engineered for the Jeep Wrangler, giving it that aggressive, aftermarket look and providing plenty of customization opportunities for the trail. 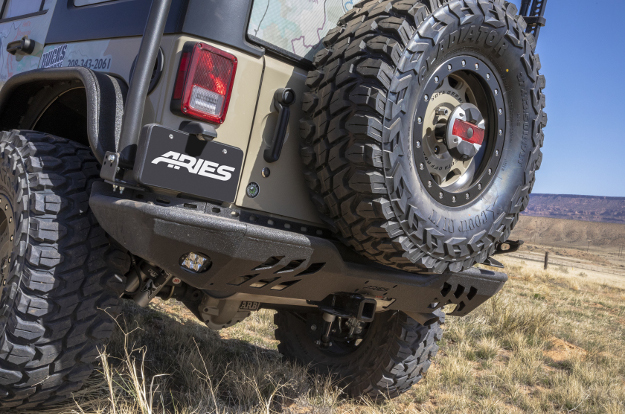 Each ARIES TrailChaser® Jeep Wrangler bumper features a number of cutouts for factory lights and mounting tabs for aftermarket lights, allowing you to light the way long after the sun sets on your offroad adventure. We also offer corner end caps with integrated LED lights. These 2" square lights shine at 2,200 lumens each and are made with grade-A Cree LED chips, waterproof construction and dual heat sinks. They are thoroughly tested and come with a waterproof wiring harness for easy installation. Check out our complete selection of LED work lights and LED light bars. To add even more style to your Jeep Wrangler and additional LED lights, we offer two brush guard options. Both are available in steel or aluminum, and each offers extra protection for the winch. The angular brush guard is styled to be a stinger brush guard and features a slotted channel along the center crossbar to mount an LED light bar or work lights. The slotted holes allow the lights to be mounted on top or underneath. The round tubular brush guard option also provides additional light mounts, featuring two welded tabs along the top. 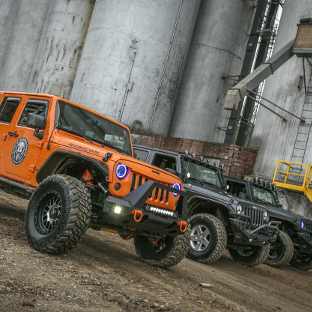 Each TrailChaser® bumper center section is built with a universal winch housing, measuring 22-1/2" x 7-3/4". 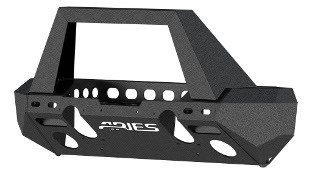 This housing has standard, slotted mounting holes to accept most types of winches. For larger winches, the housing can also accept a winch adapter plate. 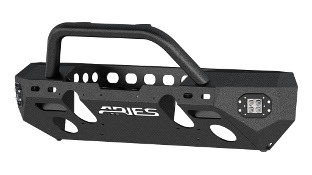 This easily bolts into the housing and has built-in fairlead brackets. We also offer fairlead accessories to maximize the functionality of your winch, including a winch fairlead mount, hawse fairlead and roller fairlead. 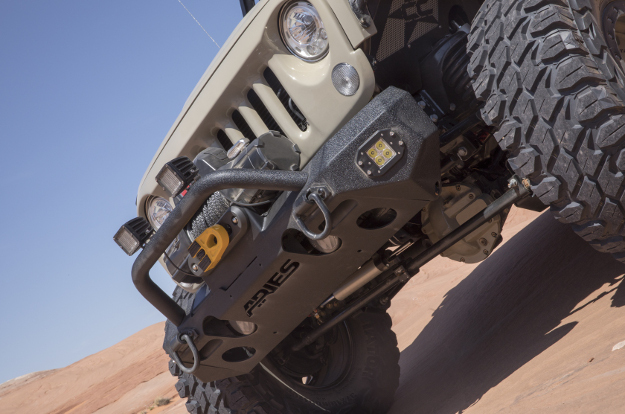 Recovering on the trail is easy with the ARIES TrailChaser® bumper. Each is equipped with pre-drilled holes for attaching tow hooks or D-rings. 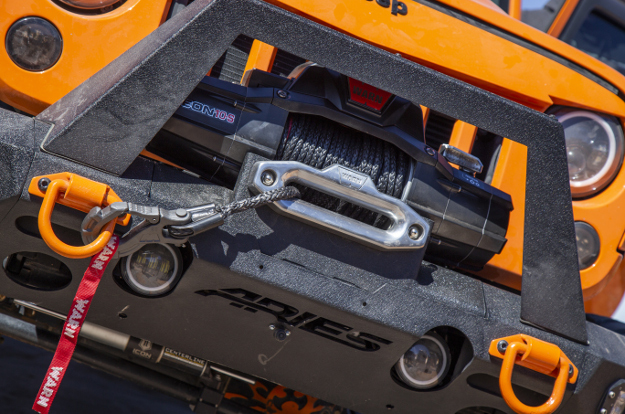 The ARIES tow hook features a work load limit of up to 9,000 lbs. (limited to mounting structure). It mounts on top of the TrailChaser® and is also compatible with Jeep YJ and TJ factory bumpers, utilizing the existing hardware. Our anti-rattle D-rings have a unique rubber grommet that installs tightly against the D-ring and helps stop vibrations. The grommet also allows the D-ring to be held in the horizontal position for convenient operation. Each D-ring is rated for up to 9,000 lbs. work load limit (limited to mounting structure). 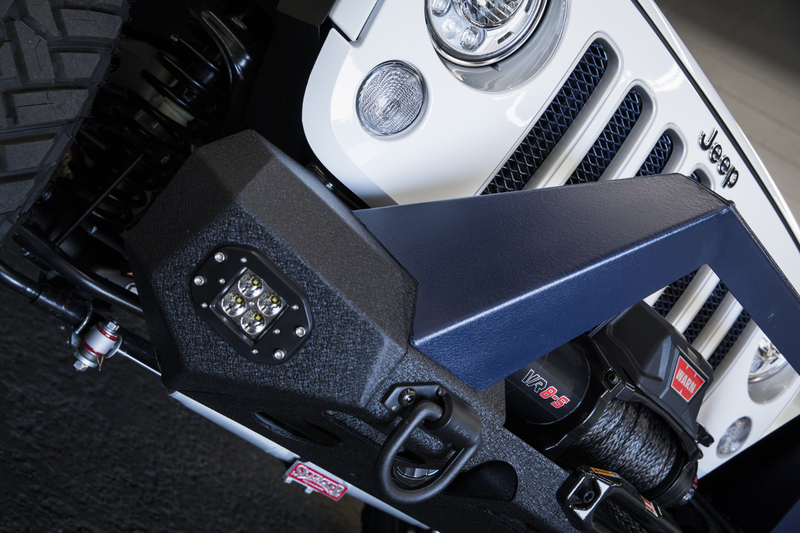 To complement the style and function of your Jeep Wrangler, all TrailChaser® bumpers are available in two material options. 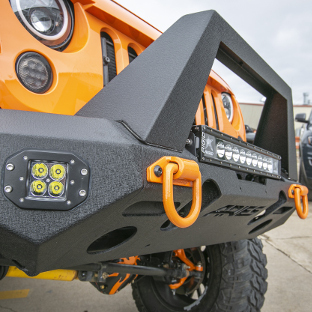 Our steel Jeep bumpers provide a high-strength option, featuring carbon steel construction. The center section, side caps and brush guards are all available in steel and bolt together for maximum strength. 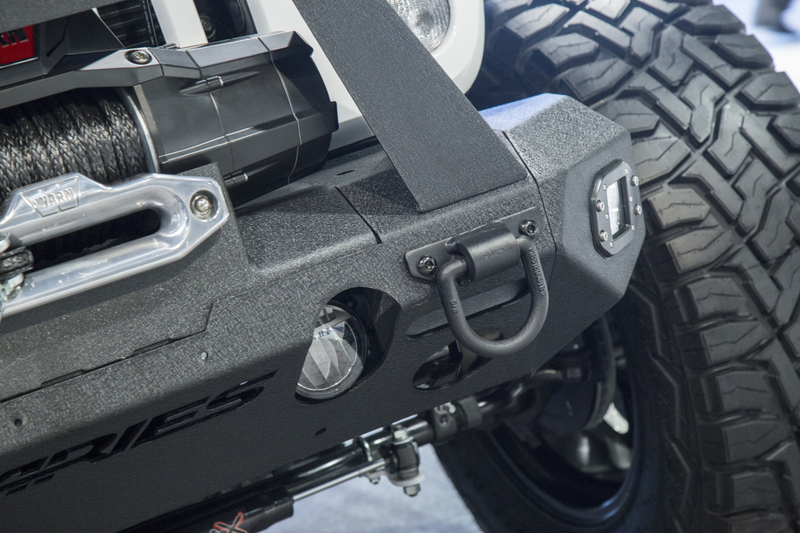 Our aluminum Jeep bumpers are lightweight and rust-free. They are made from a hardened T6 aluminum alloy, keeping your Wrangler light on its feet, while easily outlasting the elements. 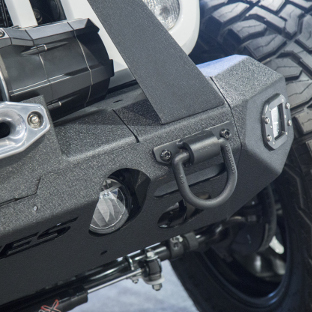 For an aggressive offroad look with trail-ready functionality, both material options of the TrailChaser® Jeep Wrangler bumper come with a textured finish. This unique texture helps hide minor scuffs, scratches and grime, keeping the finish looking clean in spite of the elements. We use is a highly durable textured black powder coat finish, protecting the steel or aluminum against rain, dirt, snow and much more. 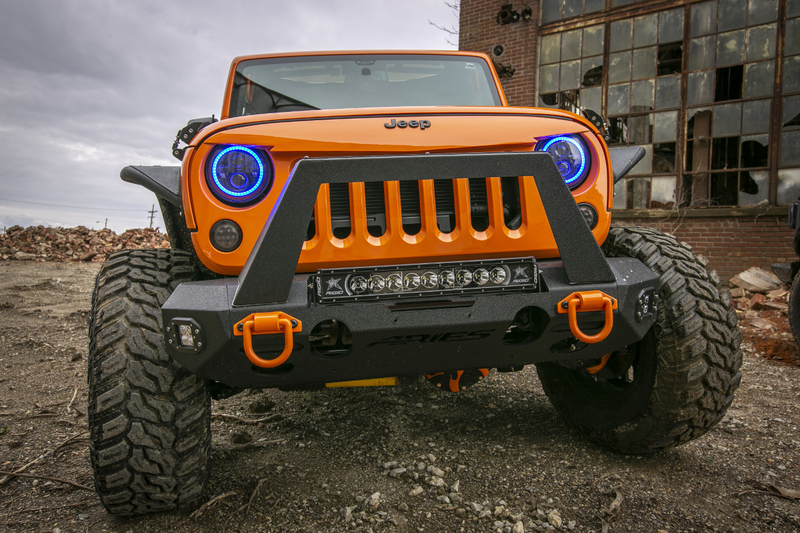 ARIES TrailChaser® Jeep Wrangler bumpers are available for both the front and rear, allowing you to completely customize the look of your Jeep from bumper to bumper. 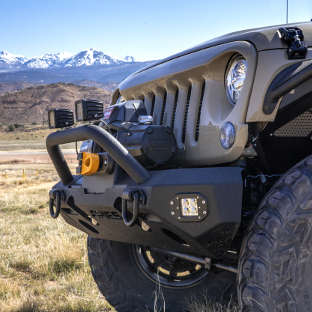 Like the front bumper, the rear TrailChaser® bumper is available in multiple options, including configurations with integrated LED lights in the side caps. The rear bumper is compatible with a rear trailer hitch receiver and installs with no drilling required. 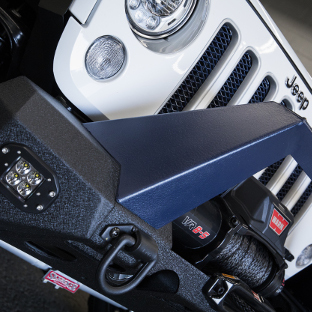 For the best possible fit and easiest install, all ARIES TrailChaser® bumpers mount onto the Jeep Wrangler using pre-existing factory holes. 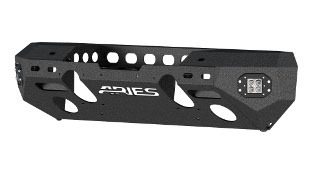 The pieces quickly and securely bolt together, and the complete configuration is designed to replace the factory bumper without requiring any additional holes to be drilled in the frame. 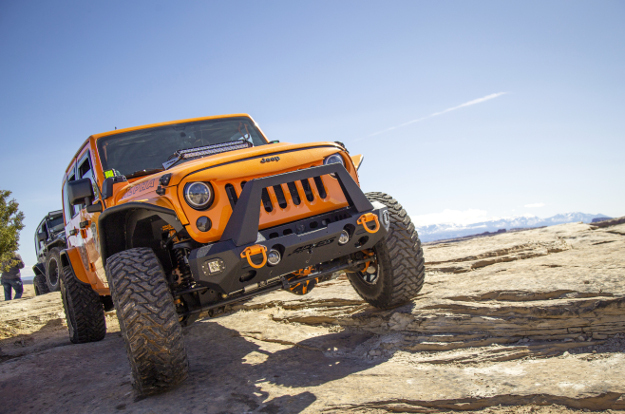 Each TrailChaser® Jeep Wrangler bumper configuration comes with all necessary mounting hardware for the install.